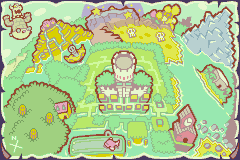 Teehee Valley is an area located in the northwestern part of the Beanbean Kingdom in Mario & Luigi: Superstar Saga. The valley was once a large seabed; however, over time, the seabed became a large desert. Teehee Valley is the only route, other than by Warp Pipe, to Little Fungitown. Mario and Luigi must go to Teehee Valley 3 times. 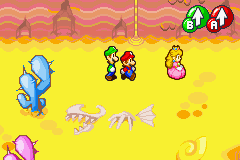 The first time, they must protect Princess Peach as she travels through the valley to Little Fungitown. They must also defeat Trunkle when it attacks Peach near the entrance of Little Fungitown. Later in the game, they travel back to Teehee Valley to try retrieving the first Beanstar piece from the landlocked S.S. Chuckola. Finally, late in the game, Mario, Peach and Toadsworth go to the valley to witness Luigi's landing after escaping the Koopa Cruiser. After Luigi is sucked underground, Mario must go find him, and the duo ends up fighting Popple and his new rookie, Birdo, in their underground hideout. At first, Teehee Valley is infested with Gritty Goombas and Spiky Snifits. After Mario and Luigi travel to Little Fungitown, however, they are mysteriously replaced by Anuboos. 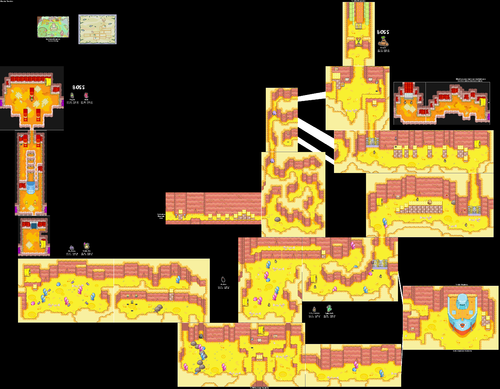 It is likely that they relocated underground, as Gritty Goombas still appear in the pipe where they would take Peach if they kidnapped her during the first visit. 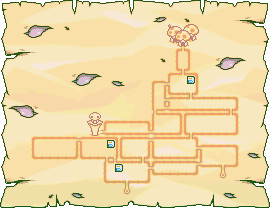 The western area of Teehee Valley is inhabited mostly by Elite Limbo Bros and Elite Dry Bones. Super Mushroom In the fifth screen to the northwest of the entrance screen, one Super Mushroom is in the leftmost ? Block in the southwest. 1-Up Mushroom In the first screen to the northwest of the entrance screen, one 1-Up Mushroom is in the rightmost ? Block in the southwest. Hoo Bean Found in hidden blocks. Chuckle Bean Found in beanholes. This page was last edited on March 25, 2019, at 06:20.